Bologna sausage (sometimes also spelled as baloney, boloney, or polony) is a kind of sausage derived from the Italian mortadella Bologna. It is a finely ground pork sausage that contains lard. According to the U.S. Government regulations, American bologna must not contain visible pieces of lard. 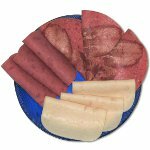 Bologna can alternatively be made of beef, turkey, chicken, lamb, venison, or soy protein. It is typically seasoned with black pepper, coriander, allspice, nutmeg, celery seed. Bologna has a distinctive flavor provided by myrtle berries. Bologna is used in the sandwich which is considered a regional specialty in the South, Midwest, and Appalachia. The bologna sandwich is made from pre-sliced bologna and white bread. It also contains various condiments and garnishes, such as mayonnaise, ketchup, mustard, cheese slices, tomatoes, pickles, onions. To celebrate the National Bologna Day, you can make a bologna sandwich or bologna burger yourself or pick it at your favorite local deli.